It is not so much ‘I think therefore I am’, but ‘I think therefore I move’. Researchers have developed a ‘brain cap’ which lets stroke patients move parts of their body using just the power of their mind. The team tracked the brain signals of healthy people as they walked along then used the data to ‘retrain’ the minds of those who were unable to move on their own. They say it can help people who have suffered a stroke, been paralysed or those who have muscle wasting diseases to walk once again. obesity and diabetes, the researchers said. They also hope the technology could help such people move other limbs they are unable to like their hands. 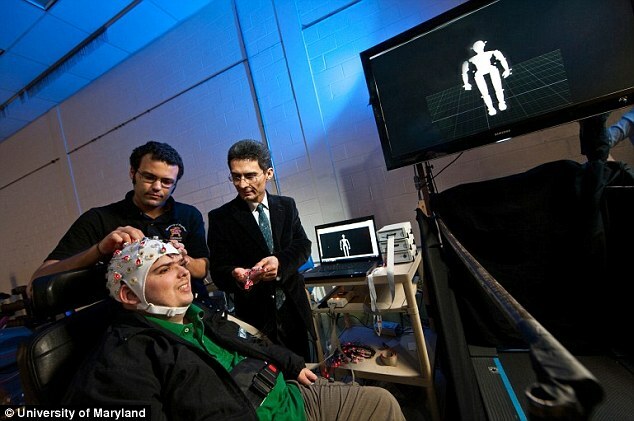 The breakthrough was part of an ongoing project by the University of Maryland (UMD). Unlike other non-invasive techniques it does not require much training and is the first to achieve results on a par with patients who have had electrodes implanted into their brains. 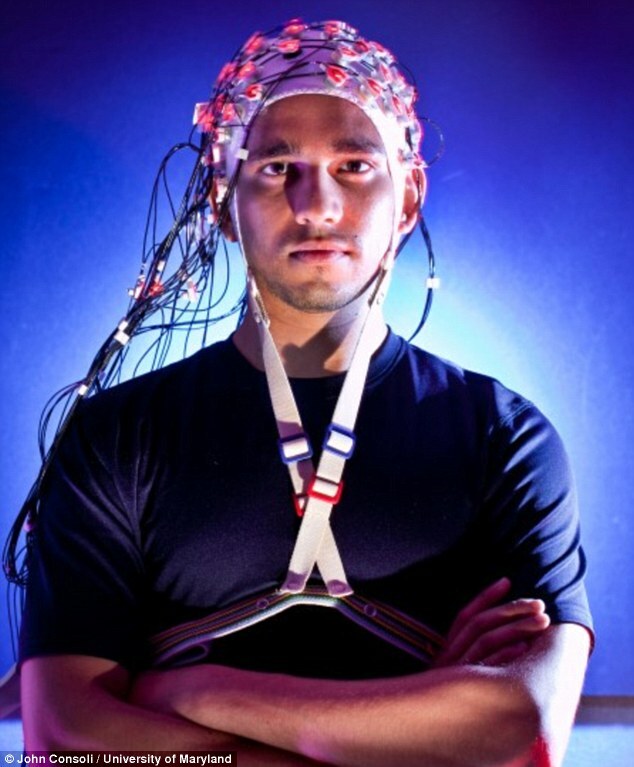 Patients wear a cap which is wired with hundreds of sensors and it connected up to the lab computers which monitor their brain waves. By scanning a healthy person undertaking a number of activities such as walking over an object or just strolling along, they know how the brain should ‘think’ when doing so. 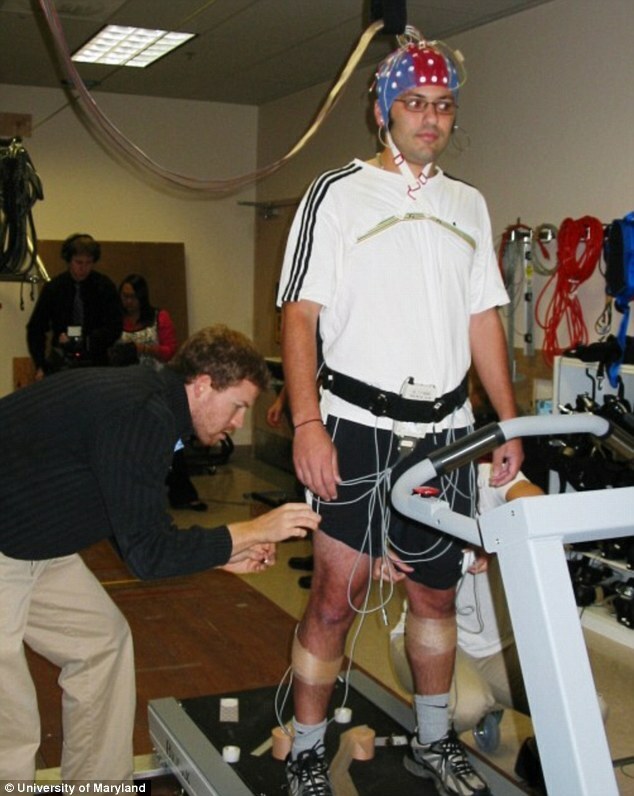 ‘By decoding the motion of a normal gait, we can then try and teach stroke victims to think in certain ways and match their own EEG signals with the normal signals,’ said José Contreras-Vidal, Associate Professor of Kinesiology at UMD. UMD biomedical doctoral student Steve Graff, who is working on the project, added that a good way of doing this is to show a patient an avatar on a computer screen who is walking properly and get them to copy it. Graff, who has congenital muscular dystrophy and is in a wheelchair, said he hopes that the technology will one day allow him to use a mobile phone or throw a football - with just the power of his mind. ‘It gives us a way to train someone to think the right thoughts to generate movement from digital avatars. If they can do that, then they can generate thoughts to move a device,’ he told Gizmag. The UMD team had previously got a patient to recreate 3D hand movements and move a computer cursor with their mind. Their aim is to help the disabled achieve a full return of motor functions following injury, paralysis or stroke.